Most graphic designers with an interest in popular culture of the late 60s would be familiar with Martin Sharp’s poster designs. His distinctive psychedelic style could be seen from Sydney, where he was born, to London where he lived and worked for several years. According to commentators of the time, Martin’s work seemed to be everywhere. If there was one graphic artist that defined an era of popular culture in the UK, it was Martin Sharp and his LSD-inspired artworks. 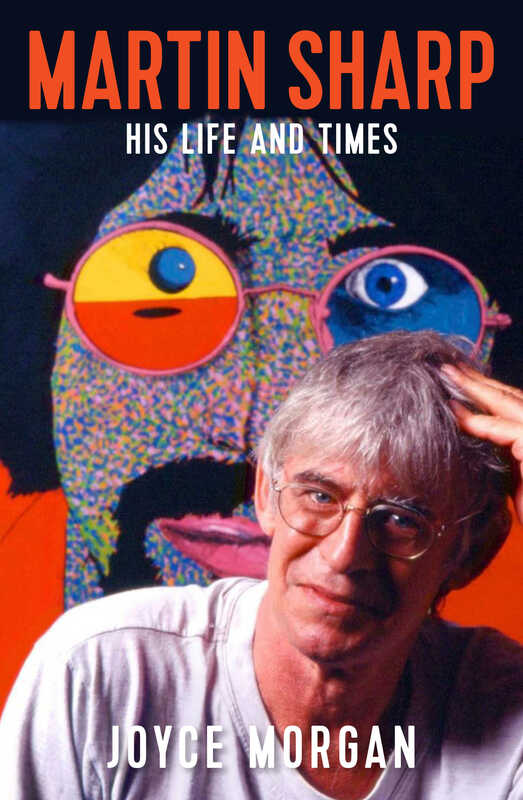 One of which was the award-winning cover for Cream’s White Room album but there were many others, and some of them Morgan has included in her book Martin Sharp: His Life and Times. At the beginning of her biography, she tells of his life in the early years. With many interviews and notations she traces his privileged beginnings in Sydney’s high society, and his early encounters with art and architectural studies before making a real contribution alongside ex-pat Australians such as Richard Neville who had worked on the infamous Oz publications that led to court cases in the UK. Despite a few brushes with the law, Martin believed London was central to his success as a graphic artist. Work such as the Jimi Hendrix poster was widely appreciated in the UK. However, he returned to Sydney where he became obsessed with his projects, in particular, the Yellow House – which was his studio, a tribute to Van Gogh, and an experiment in communal living. Always creative and collaborative in the way he worked, Martin often handed his friends – and anyone who wandered into the studio – a pair of scissors or a paintbrush and invited them to contribute to the design he was working on at the time. He was by general consensus messy in his methods and often worked with a cigarette in his mouth, dropping ash onto the work. While his habits were an irritation to his friends, a rather more serious and difficult issue was his inability to form long-term relationships with the women in his life – of which there were many. And then there was Tiny Tim, the weird American musician with whom Martin was fixated according to Morgan. Luna Park in Sydney was yet another obsession. He was often redesigning the iconic attraction to make the park work for the people rather than let a dodgy developer tear it down and replace the site with apartments. He played a crucial role in saving Luna Park from disappearing and ending up in the hands of Souris, a developer who Martin was sure had tried already to burn down Luna Park . Towards the end of his life he inherited from his grandmother, Wirian, a mansion in Sydney where he lived and worked in his messy way for the rest of his life. But even stranger than his work practices was his late conversion to Christianity. Martin spent the last years of his life searching for an explanation of what the Kingdom of Heaven would look like. Martin never found the affirmation he was looking for but his fruitless search towards the end of the book made Martin’s life seem even more eccentric. Regardless of whether the reader likes his design skills or not, the life of Martin Sharp was never boring. With excellent research, good sources and bibliographic details, Morgan’s book never fails to be a fascinating account of Martin’s life in every chapter. Martin Sharp: His Life and Times by Joyce Morgan is for download as an e-book or you can borrow a hard copy at State Library of Queensland.